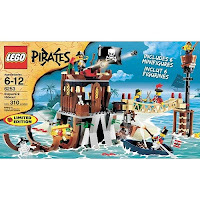 Brick Bender: Toy stores, ahoy! "No, I don't need a gift receipt," is starting to become a mantra for me. While it's still weird to go into a toy store and shop for myself, I'm getting used to the idea because it is happening with greater frequency. On the other hand, I could never leave home. I could be like Sandy Bullock in "The Net," and get my LEGO sets from LEGO.com and my Domino's pizza off my TiVo; but sometimes you want to pick up the box and see what you're buying before swiping your credit card. I snagged the LEGO Pirates Shipwreck Hideout yesterday, which to the delight of my wife features a lady pirate. But with a trap door and shooting cannon, who can't find inspiration in this new set?